Despite softening economic conditions, home building economic data have been fairly positive in recent months. For example, the pace of housing starts now stands near a seven-year high. And as NAHB forecasted last quarter, the period of declines for the outstanding stock of Acquisition, Development and Construction loans appears to have ended. According to data from the FDIC, for the first time since the first quarter of 2008, the total amount of loans outstanding for residential construction (1 to 4 units) rose on a quarter-over-quarter basis. The amount of the net increase was small (about $22 million), with the stock growing from $43.54 billion to $43.56 billion from the first to second quarter of 2012. 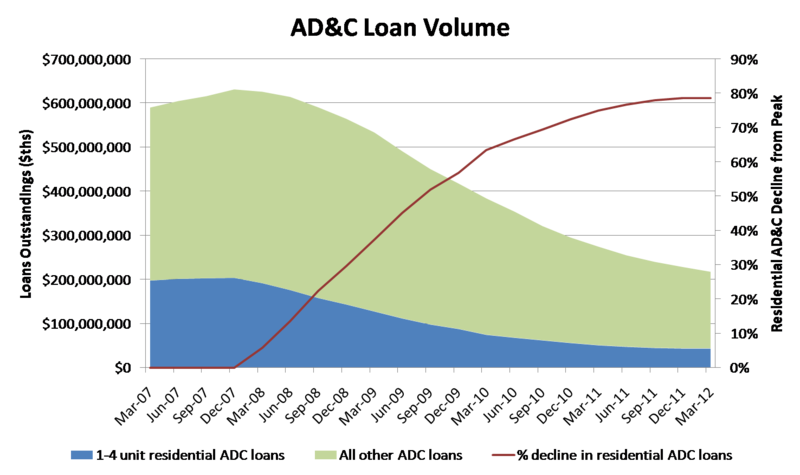 It is worth noting – this is a net change, so given ongoing payoffs/discharges of existing AD&C loans, the actual amount of originated lending for AD&C purposes was considerably larger but cannot be estimated using the FDIC data. The stock of residential AD&C loans (the blue area on the graph below) now stands 79% lower (denoted by the red line)than the peak level of AD&C lending of $203.8 billion reached during the first quarter of 2008. The slight increase in residential AD&C lending follows several quarters of progressively slower declines. The first quarter 2012 AD&C loan total was only 2.9% lower than the previous quarter, which in turn was 5.4% lower than the third quarter of 2011. Before mid-2011, quarterly declines averaged about 10%. The FDIC data reveal that the total decline from peak lending for home building AD&C loans continues to exceed that of other AD&C loans (nonresidential and some land development). Although these non-home building AD&C loans declined in the second quarter by nearly 6%, such forms of AD&C lending are off a smaller 60.4% from the peak. However, it is worth noting that some land development loans connected to home building are grouped in this other class. NAHB survey data suggest land development loans face tighter lending conditions than loans for residential construction purposes, so the quarterly decline in this other class may reflect ongoing tightness for acquisition and development purposes. A broader look at credit conditions comes from the Senior Loan Office Survey from the Federal Reserve, which has generally been more positive than both the FDIC data and NAHB surveys. In general, the Fed survey indicated that the days of credit tightening, as reported by lending institutions, ended some time ago. For example, the Fed survey results suggest that net tightening for homebuyer mortgage lending generally ended in 2010. This is consistent with the FDIC data on total residential mortgage debt, which has been relatively flat over the last two years despite ongoing household balance sheet repair. However, the Fed survey data for commercial real estate (CRE) lending report no net tightening since late 2010, a period when AD&C loans outstanding have declined. This is in part due to the fact that the CRE category in the Fed survey covers a broader class of lending than home building AD&C. Nonetheless, the most recent Fed survey results suggest that commercial real estate lending conditions are, on net, loosening, which is a positive signal for the availability of business credit in the coming months. Despite the uptick in residential AD&C lending, a lending gap continues to exist between home building demand and available credit. Since the beginning of 2007, the dollar value of single-family permitted construction has fallen 54%. During this same period, home building lending for AD&C purposes is down 79%. If we assume that the ratio of total AD&C lending to the value of housing permits at the beginning of 2007 reflected normal levels (total AD&C loans outstanding equaling 87% of permitted value), then a lending gap opened in the middle of 2010. Using the same benchmarks, total AD&C lending should be nearly $47 billion higher to support today’s level of housing permits. And despite the quarterly increase in AD&C lending, the size of this gap grew from the first quarter to the second quarter of 2012. The gap was only $40 billion for the first quarter, implying there is room to grow for AD&C lending purposes. This gap is made up with other sources of capital, including equity and investments from non-financial institutions, which may in many cases offer less favorable terms for home builders than traditional AD&C loans. 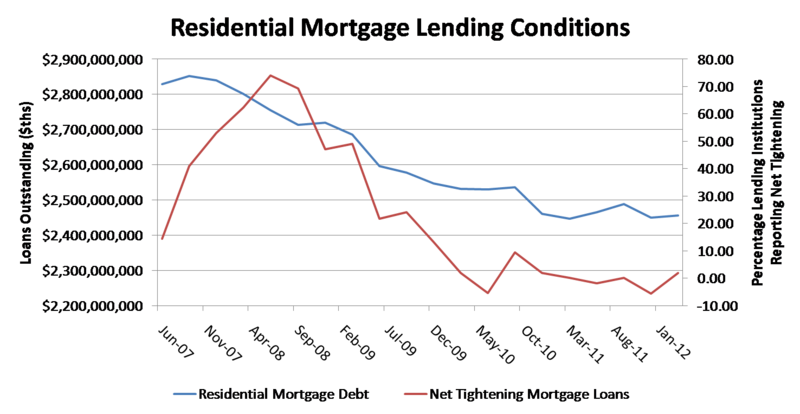 So while the declines in total AD&C lending may have ended as of the second quarter, lending conditions remain tight. And the tightness in lending is holding back home building from contributing more to a robust economic recovery in areas where demand for new homes is growing.